At the middle of the battle of the bands, the host then introduced Sam Milby the hottest matinee idol who is also a recordig artist. I was able to capture him on video about his rendition of the Filipino classical song Maging Sino Ka Man. The ladies and girls went gaga over him. Some were at my back and they shouted for Sam and my eardrum almost broke. 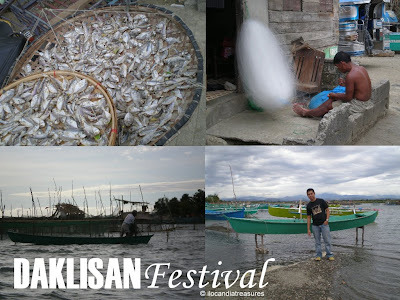 I was advised by a friend from Ilocos Sur that Kannawidan Festival was ongoing especially a performance of tribal dances and rituals will be held in the evening of January 30. But it was a wrong tip for me regarding the schedule because on my arrival after a big rush from Laoag City, the said event was already finished. It was held in the afternoon. As I checked in the program of activities, it was also reflected to be at 7pm. Anyway, there were several tribal groups who presented their practices and their music and dance to depict the lifestyle of uplanders. They wore their traditional costumes and danced with their traditional music. The event was held infront of the capitol. 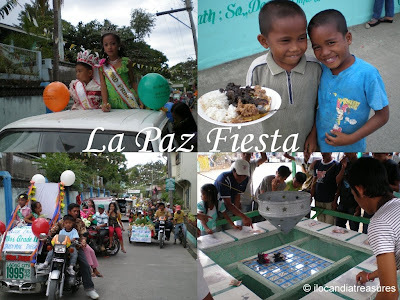 This is the second time that this festival was held in commemoration of the foundation anniversary of the province. 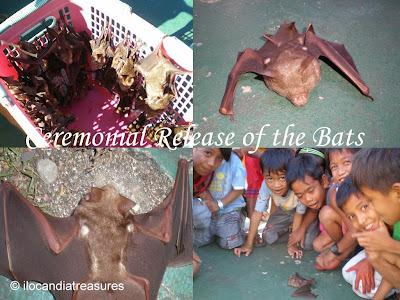 It was named before as Ylocos covering the whole of Ilocos Norte and even Abra. Kannawidan refers to traditions. This big affair was opened on January 28 and lasts until February 4, 2009. 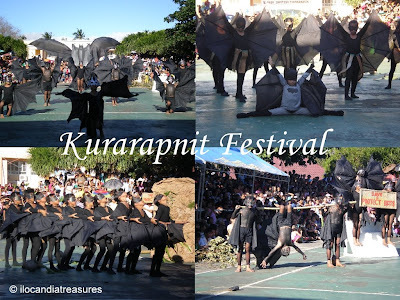 They have lined up various activities for this occasion such as the battle of the bands, concerts, calesa, caritela and vintage vehicles parade, pageants, horse race, fashion show, games and many others. I was not keen to watch the battle of the bands but the people from the Office of Governor Savellano were kind to entertain me and they gave me a seat infront of the stage so I watched it anyway. I enjoyed watching since most of the bands were good performers. I liked the performance of the band called Frozen Fire. The other bands which I saw were Sundae Cone Band, Rhythm Section Band, Samiweng Iloko Band, Half Six Band, Sweet Taste of Defeat Band, and Half Age Band. All the 18 groups interpreted one alternative and one reggae song. The last piece was their original Ilocano composition depicting the theme. Their renditions of their original Ilocano songs were just amazing. The Effeil Tower has become the landmark and the very icon of Paris and that it symbolizes romance where Paris has been popularly known for. It is one of the world’s recognizable structures. It is actually an iron tower built at the Champ de Mars used as observation and radio broadcasting tower. It was constructed for two years and completed in 1889. From then on, more than 200 million people and that includes me visited the tower. It has a height of 325 meters or 1,063 feet which is like an 81 levels of a conventional building. It is truly fascinating site. I can’t help but to jump and rush upon arrival from the MRT station to the site to experience its wonder when I paid a visit in 2007. Making it the most visited paid monument of the world. There was an entrance fee of 8euros going up using the elevator but on foot which I did was only 4 euros. So I climbed the spiral stairs braving the rain with my umbrella since it was drizzling at that time. It was an amazing feeling to be on top of the world at the very heart of Europe. 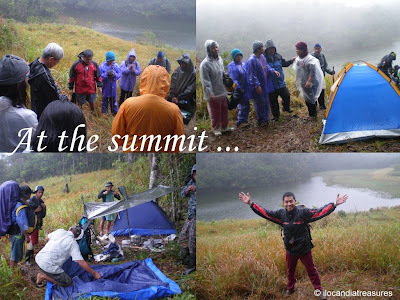 I was stranded on top because of the heavy rain. From morning till early afternoon, it has not stopped. I got only one day to be around Paris so I did not have a choice but to go down, shot photos and get around. However the weather just got so unpredictable. The sun showed up few minutes after my descent. I missed a good lighting for my photos and only a cloudy background of the Eiffel Tower was taken by me. There was a café and restaurant at the top where you can buy snacks at. But prices doubled up here. A souvenir shop was also open for you to buy miniature Eiffel Tower monuments and other items. A certificate of ascension to the tower was also available for a fee. It was one of the finalists in the Seven Wonders of the World being voted popularly by the world in the year 2007. 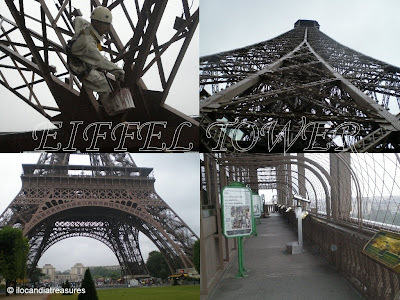 The said structure was named after its designer and engineer Alexander Gustave Eiffel. He also designed the Statue of Liberty in New York. These are the two very significant and popular works he did. Surprising to know also that he has works in the Philippines that include the San Sebastian Church in Manila and the two Quezon Bridges in Quiapo and Pasig River in Manila. This article came out on the national broadsheet Manila Bulletin on January 17, 2009 issue. By virtue of Republic Act No. 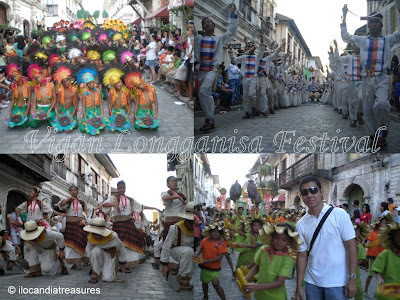 8988 enacted on January 22, 2001, the capital Vigan of the province of Ilocos Sur became a city. It is now on its 8th year to cityhood. However, this is already an old city because it is now 250 years in existence since the royal decree issued by King Ferdinand VI. Its former name was Ciudad Fernandina. To trace back, Abra had been a former territory of Vigan until she gained independence. Thus, the government officials of the municipality of Bangued were invited to this occasion to witness the commemoration of its foundation anniversary as a city. The city is famous for its variety of food products such as empanada, bibingka, bagnet, sinanglaw and many others. However, the Biguenos had paid tribute to the much well known product called longaniza or pork sausage. This sausage has a distinct taste of an Ilocano. The ground pork had been added with seasonings particularly of garlic and Iloko sugar cane vinegar that gives the native taste and the mixture is put inside the intestinal epithelium or sheath and being fried on a pan. It has been patronized by visitors and guests of the city. The celebration has the purpose to promote much further this food product. 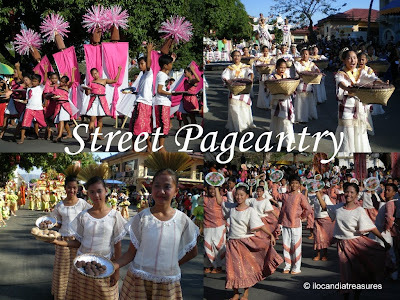 In line with this, a street pageantry highlighted the fiesta celebration showcasing the Vigan Longaniza. There were 18 groups who competed in three different categories namely: elementary, secondary and open divisions. The dancers wore colorful costumes made up of the indigenous textile called abel. They accentuated their costumes with the beautiful headresses made of feathers and other indigenous materials. They held in their hands plates with longganizas. They danced to a uniform music which was a lively one. They have depicted on their dance moves on how to make or cook the sausage and even how to serve it with the presence of cooks and waiters in the dance parade. The various groups started their dance from the city hall after the opening program following the speeches of Mayor Eva Medina and other important personalities. They ended up to the beautiful site of the Heritage Street. It’s truly a wonderful pageantry which I enjoyed so much. A feast for the eyes and not for the stomach since generally Ilocanos do not prepare foods at home as what people in the Southern Philippines are used to. People simply partake foods after the event eating barbeque, grilled longganiza, okoy, empanadas at the plaza just like what I did. Exactly 11 years ago when I visited the town of Adams in Ilocos Norte and this time was my second. It still awed me with its marvelous beauty. 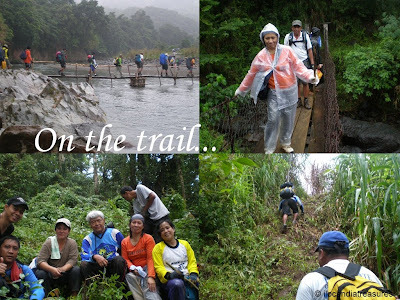 I remember that we crossed around ten rivers before we reached the town proper. We walked through the hanging bridges. From that vantage point I saw some adults and children swimming. I joined them swim. The children were quite shy but they showed off their skillful style of swimming. Despite the strong current of the river water they can still cross the river straight. However for my case I was almost taken by the flow of water. I saw the picturesque sceneries. The green mountain ranges were so perfect accentuated by the rushing water of the river and the waterfalls. One can safely drink clear and cool water straight from the river or at the falls. This is the place where I first tried eating the delicious adobo meat of wild pig. It’s endemic to the forests of the town. The lifestyle of people is so simple. Traditionally, they just live in a wooden and nipa hut. They use wood to set fire on their stoves. They make use of the clay pots to cook their foods. The vegetables they cook were so fresh picked from their backyards or fields. 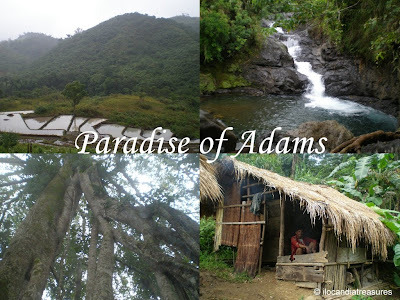 Adams is a 5th class municipality and it is composed of only one barangay covering an area of 138.25 km2. It was founded on May 16, 1983. History says that there was no factual record of the town before 1918. 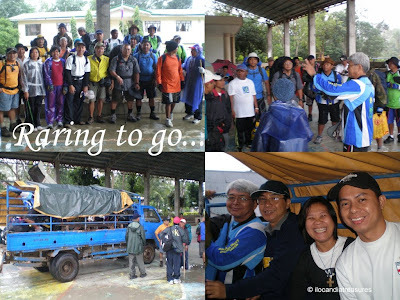 But a legend was often retold that during the term of American Governor William Taft who was fascinated by Baguio’s climate, some of his American constituents would love to stay north of warm Manila and some landed in Pasaleng Bay. The tribes folk thought that they were being raided by pirates and rushed to the deep forests climbing the mountain cliff and steep ravines. They reached a valley with crystal clear water cascading downstream which is referred to now as the Bolo River. It was abundant of eels and fishes. They harvest many fruits and vegetables and catch deers and wild boars. With the bountiful blessings, they branded it as Karayan ni Adan but its name was later corrupted to Adams. Adams is another wonder of nature. It’s a site to behold. Truly one can say it’s a Garden of Eden.